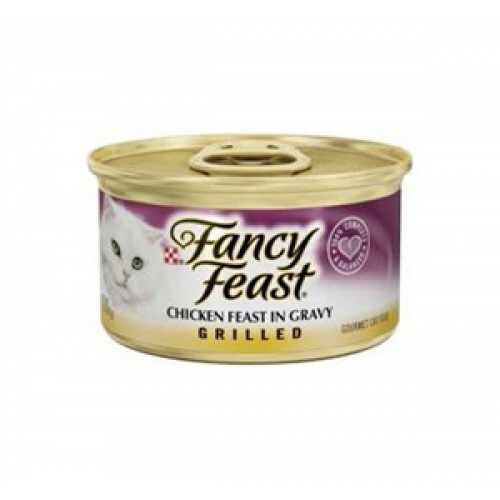 Luscious cuts of slow-cooked chicken feast, in a sumptuous basting of gravy. Chicken, Broth, Chicken, Liver, Wheat Gluten, Meat By-Products, Corn Starch-Modified, Artificial and Natural Flavors, Salt, Calcium Phosphate, Soy Protein Concentrate, Added Color, Potassium Chloride, Taurine, Magnesium Sulfate, Choline Chloride, Thiamine Mononitrate, Vitamin E Supplement, Zinc Sulfate, Ferrous Sulfate, Niacin, Calcium Pantothenate, Vitamin A Supplement, Menadione Sodium Bisulfite Complex (Source of Vitamin K Activity), Copper Sulfate, Manganese Sulfate, Pyridoxine Hydrochloride, Riboflavin Supplement, Vitamin B-12 Supplement, Biotin, Folic Acid, Vitamin D-3 Supplement, Potassium Iodide. 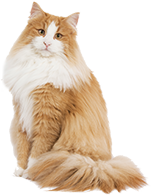 Feed an average size adult cat 1 can per 3 pounds of body weight daily. Feed up to twice this amount to kittens.